Ugh. I am so frustrated. I mean, UGH! First of all, you should know that Ellen doesn’t care about me or my happiness. She doesn’t want to help a struggling gal like myself, so there’s nothing I can do about that. Now I have 2 celebrities ignoring me but WHATEVER! What’s really got a bee in my bonnet is a recent statement by Jonathan that is flooding the rags and the Interwebs. Ummm, HELLO???? What in the hell does a gal have to do? 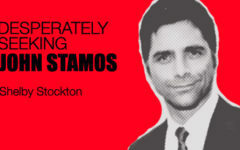 Let me break it down for you, Stamos. 2) I’m in fantastic shape. I’ll get in a swimsuit RIGHT NOW and walk down Sunset Blvd. I’ll do it! 5) I don’t mean to toot my own horn (obviously from the statements above), but more than one ex boyfriend of mine has told me that I’m the one that got away. Impressive, no? I’m tired. I’m weak. But again friends, I must persevere. HELP ME SOMEONE!!! !